This week we witnessed a historic first: the first Pope in history to have visited the Arabian Peninsula. Not only this, but the world witnessed for the first time, a demanding declaration on human fraternity signed between Catholicism and Muslims, signed by the Pope and Grand Imam Dr. Ahmed Al Tayeb of the mosque and university of Al Azhar in Egypt, detailing the need to work for peace, protect religious freedom, permit citizenship for all religions, and protect places of worship. This trip also marked the first time there has ever been a public Mass in the Islamic country or in the entire Southern Arabian Peninsula. 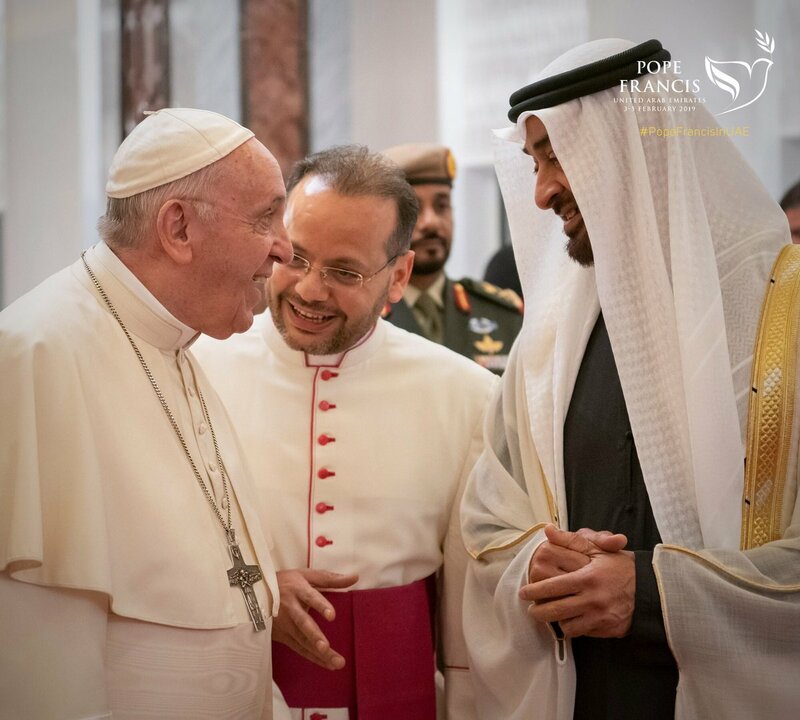 ZENIT Senior Vatican Correspondent, Deborah Castellano Lubov, covered Pope Francis’ historic trip to the United Arab Emirates, specifically its capital of Abu Dhabi, Feb. 3-5, 2019, from the papal flight. Traveling along with the Pontiff, she collected many perspectives. The United Arab Emirates has been seen by many as a model of peaceful coexistence among religions and cultures, despite limitations. They have proclaimed 2019 the Year of Tolerance, instituted a Ministry of Tolerance, renamed the Grand Mosque to be called ‘Mary, Mother of Jesus’ Grand Mosque (an initiative called for by the Crown Prince of Abu Dhabi himself), and promoted initiatives to help Hindus and other faiths. The few Catholic parishes throughout the Emirates are thriving and vital, Deborah Lubov was told in her exclusive interviews with the Apostolic Vicar of Southern Arabia, Bishop Paul Hinder, Jordanian Sister Madeleine Dababneh of the Sisters of the Rosary, Catholic school principal in Abu Dhabi, as well as by faithful she spoke to on the ground. The Catholic Church in the UAE makes up nearly 10 percent of the population, numbering some 900,000, and they are all foreigners who have come to the UAE for work, primarily from India and the Philippines. There are nine parishes in the country that started under the guidance and support of the late Sheikh Zayed and have flourished under the UAE leadership. They are all under the lordship of Bishop Paul Hinder, the Apostolic Vicar of Southern Arabia. Three Masses are held daily and obligatory Masses are spread over three days Fridays, Saturdays, the official weekend in the UAE, and Sundays. The churches are packed on these days; close to 70,000 people attend these weekly obligatory Masses. At Christmas and Easter, there are Masses throughout the day, in over 10 languages. Twenty-five Masses were celebrated on Christmas Day, this year. Weekly catechism classes are available in English, Arabic and French. They are prepared for their First Holy Communion by the nuns of St. Joseph’s School, assisted by the lay ministers. All sacraments are available to the Catholic community. Deborah Lubov spoke to one of the two sisters who met the Pope during his private visit at the parish, Jordanian Sister Madeleine Dababneh, who belongs to the Rosary Congregation, and has been living in UAE for 19 years. Having taken her first vows in Jerusalem in 1975, she has been in the field of education since 1978, and is currently principal of a Catholic school. After nearly 20 years in the Arab Muslim nation, Sister feels grateful and free to live her faith, and never threatened. She discusses the religious freedom in the country and the government’s commitment and openness to welcoming other religions, as well as all the active work of the Catholic community in the area, especially of her and her fellow sisters. “The Rosary Congregation was established in 1880 in Jerusalem for serving the faithful in the Arab countries. The aim was to serve the public and give back to the local community through setting up schools, cultural centers, and hospitals. The congregation also established teaching centers for tailoring and needlework for women.” Over time, this congregation has made a name for itself in the field of education and now has branches in Palestine, Jordan, Lebanon, Syria, Rome, Egypt, Kuwait, Abu Dhabi and Sharjah. One of the outstanding features of the Rosary Schools is the very high standard of pastoral care offered by the Sisters and attention to health, safety and protection. Zenit, covering the trip from the papal flight, offered various perspectives. “I think this meeting and trip is important itself because it is in the Emirates, in the birthplace of Islam,” Archbishop Pierbattista Pizzaballa, Apostolic Administrator of Jerusalem. While he noted, we have seen progress in dialogue between Christians and Muslims, and with other religions, also in Muslim-majority countries, this one to the UAE has been a historic step forward. On Feb. 4, the first full day of the trip, dedicated to interreligious dialogue, at the International Interfaith Meeting on Peace, Pope Francis and the Grand Imam of Al Azhar signed a joint declaration on Human Fraternity, calling for all concerned parties to promote religious freedom, protect places of worship, and offer citizenship, even to religious minorities. During the Pope’s address at the International Interfaith Meeting on Human Fraternity, he praised the model of coexistence and tolerance he found in the UAE, but also referenced the suffering in Yemen, who the UAE has been an ally of Saudi Arabia in a military coalition in the Civil War which has been raging on for four years against Iran. According to UN statistics, the humanitarian crisis has left nearly 10 million starving, including many children. At the Mass, Vatican flags were waving left and right, with children chanting, ‘Pope Francis, Pope Francis, Pope Francis!’ at the top of their lungs. Before the Mass started, there was massive applause when the announcements reminded those gathered how grateful they should be to the United Arab Emirates and its rulers, especially the Crown Prince of Abu Dhabi, for making this trip and this Mass, the largest gathering of Christians in the Arabian Peninsula possible. This trip will be followed by the Pope’s Apostolic Visit to Morocco, March 30-31, 2019. On the Papal Flight, arriving in the Emirates, ZENIT’s Senior Vatican Correspondent, Deborah Castellano Lubov, greeted the Holy Father, asking him to bless images of her little nephew, Everett, and little niece, Josephine. Josephine’s image was taken at her recent baptism. The Holy Father was happy to do so and prayed above the little ones. ZENIT was near Francis again during the airborne press conference, when responding to questions on the declaration on “Human Fraternity,” signed between Francis and the Grand Imam of Al-Azhar, the Holy Father underscored that it condemns every form of terrorism.